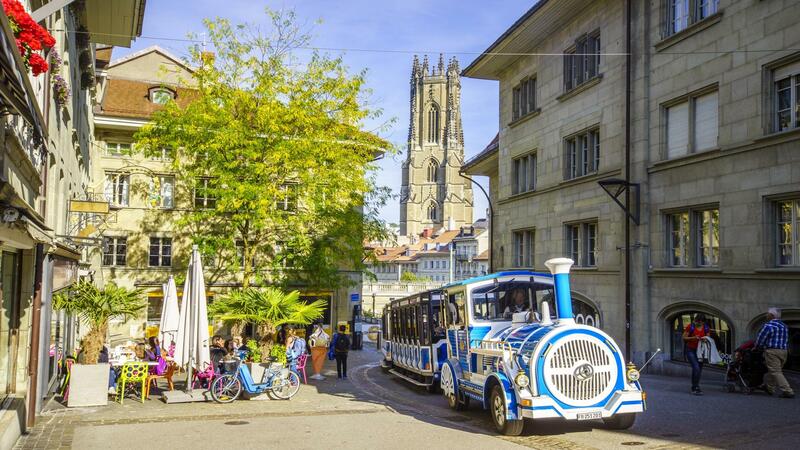 Spend an hour weaving your way through the picturesque spots of the town of Fribourg and immerse yourself in the medieval atmosphere of the Old Town with this guided tour. From this spring it is possible to get on and off (hop on & hop off system) the little train on the track. 5 fixed scheduled stops punctuates the route. Place Jean-Tinguely (Equilibre), Pont de Zähringen, Bourg-Quarter, Rue de Morat, Poya-Bridge, Bourguillon, Lorette, Pont du Milieu, Pont de Berne, Pont inférieur de Zähringen, Rue de la Lenda, Rue de la Samaritaine, Pont de St-Jean, Grand-Fontaine, Rue de Lausanne, Rue de Romont, Place Jean-Tinguely. Equilibre, Lorette (Loreto Chapel), Auge (Place du Petit-St-Jean), Neuveville (Planche-Supérieure) and Bourg (Rue de Lausanne). Place Jean Tinguely 1 (Equilibre Theater - Tourist Office) or on the parcours. The tickets, valid for a whole day, are on sale at Fribourg Tourism or directly at the driver. Little train is fullybooked? Please contact Fribourg Tourism in advance. Reservation from 15 pax. The little train runs as usual over Easter as well as on Easter Monday. The little train leaves at the usual departure times on the Ascension Day, 30 May 2019. On Whit Monday, 10 June 2019, the little train leaves at the usual departure times. Due to the event " 12 heures de l'Auge " (Saturday, 15 June 2019), the itinerary of the little train will be modified, but will still last 1 hour. Due to the procession on Corpus Christi, the little train will not depart at 10.00 and 11.00 hrs on Thursday, 20 June 2019. Due to a special reservation, the little train will not depart at 5 pm on Saturday, 29 June 2019. On 1 August (National Day) and 15 August (Assumption Day) the little train leaves at the usual departure times. On Sunday, 6 October, the little train does not run due to the Morat-Fribourg Run.